Annual digital subscription only €20 – click here to purchase from Exact Edition digital newsstand. Mary Kenny asks why the Irish only recognise fiction and poetry when defining a writer. An obituary by Kevin Kiely. A personal tribute by Michael O’Brien. Our Christmas book guide is tailored to find the right book for family and friends. Compiled by Tony Canavan and Caoimhe Fox. 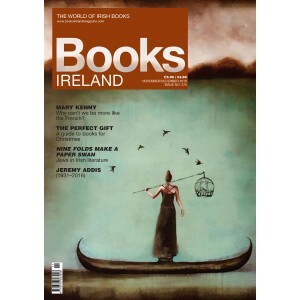 Barry Montgomery examines Ruth Gilligan’s Nine Folds Make a Paper Swan and Jews in Irish literature. Paul Bolger describes how the graphic novel Hound is going to the big screen. Una MacConville discovers the Ox Mountain Book Bindery. Tony Canavan looks at Orson Wells’s film of Trouble in the Glen. Mary Davies assesses the newly published Heritage Irish Plants—Plandaí Oidhreachta. Hugh McFadden—Imaginary Bonnets with Real Bees in Them, by Paula Meehan. Kevin Kiely—The Ordnance Survey and Modern Irish Literature, by Cóilín Parsons. Anne O’Leary—The End of the Modern World, by Anthony Cronin. Carina McNally—An Island Community: the ebb and flow of the Great Blasket island, by Mícheál de Mórdha. Fred Johnston—The Future Always Makes Me So Thirsty: new poets from the North of Ireland, edited by Sinéad Morrissey and Stephen Connolly. Aubrey Malone—I’ll Drop You a Line: a life with David Marcus, by Ita Daly. John Gibney—More than Concrete Blocks: Dublin city’s twentieth-century buildings and their stories. Volume 1, 1900–40, edited by Ellen Rowley. David O’Donoghue—Heroes of Jadotville: the soldiers’ story, by Rose Doyle. Anne Cunningham—The Years that Followed, by Catherine Dunne. Carla King—100 Irish Stories of the Great War: Ireland’s experience of the 1914–1918 conflict, by Steven Moore. Jennifer Martin—Oscar Wilde’s Elegant Republic: transformation, dislocation and fantasy in fin-de-siècle Paris, by David Charles Rose. Sue Leonard puts the spotlight on the best of newly published authors. Paula O’Hare with the latest haul of crime novels. Tony Canavanassesses the new releases sent in since the last issue. Declan Burke explains why he just cannot put down John Fowles’s The Magus.